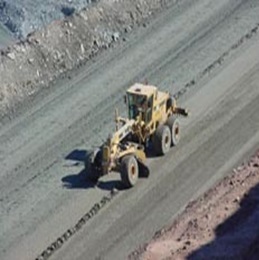 Blasting breaks the rock into loose material that mining equipment can dig and carry. 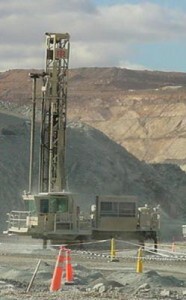 Before blasting, it is necessary to drill holes in the rock to insert explosives. These holes are drilled by a fleet of production drill rigs and drilled in a “pattern” in an area of the bench identified for blasting. Once the pattern has been drilled, its holes are checked for depth and the presence of water. This “quality control” ensures that blasts are as effective as possible and reduces poor blasting practices that may result in toe or oversize in the blast. The holes are then charged – loaded with explosives. A detonator (det) and primer are lowered down the hole to hang about 1m from the bottom. Once all holes have been charged and the blast tied in, it is ready for blasting. Blasting depending on production requirements. Blasting is done on a hole-by-hole basis – no two holes are blasted at exactly the same time. This also helps reduce noise and vibration. 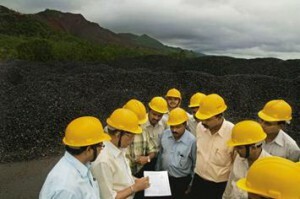 The blast is initiated by remote control from one of several control rooms spread around the surface of the open pit. After blasting, Excavators and Shovel does their work of collecting the blasted ores and pile them together. Once the shovels and trucks have cleaned off the blast, it is time to send in the clean-up equipment. These machines clean up the walls, pull out any material from the old workings that the shovels couldn’t reach and generally tidy up the bench for general use. Once this is done, surveyors mark up the old workings and the process starts all over again.